I’ve yet to meet a person who does not appreciate a great Brownie. Some days, I will accept a not so great brownie. Why “just make brownies” when the possibilities are endless. (1) mini marshmallows and chopped nuts (2) Any king size candy bar, chopped into small pieces (3) coconut (4) mashed banana (5) white chocolate or butterscotch chips (6) toffee pieces (7) a tablespoon of extract (mint, almond…) or liqueur like Kahlua or Grand Marnier (8) Dried fruit, like cranberries (9) sift in tablespoon or two of instant espresso into the flour. (10) An Andes Mint (11) acouple pretzel M&M’s (12) half of a mini peanut butter cup (13) those cute Halloween pumpkins (14) small piece of caramel…. (16) Spread raspberry or cherry preserves over top, drizzle melted chocolate (17) Crushed candy canes, while still warm, press in with back of spoon so the pieces stay in place (18) sprinkle chips like white chocolate or peanut butter over top and set in the still hot oven for afew seconds to melt, then spread like frosting (19) Top with melted caramel (or caramel sundae topping) and walnuts for Turtles (20) The obvious….experiment with your favorite frosting recipes like cream cheese or german chocolate. And my mom’s trick: She has always made the best fudgy brownies. She says “it’s the same recipe you use.” To which I answer “Oh, no, no…mine do NOT turn out so melty and gooey !” She confesses – “Oh, I came across a trick by accident. I under-baked a batch once and every one went nuts over it.” She really irks me sometimes. Anyway, under-bake only by about 5 minutes and keep in mind it does make it more difficult to serve and eat. As if I care. When I do this, I don’t feel the need to dress them up with another variation, just hand me a fork. Preheat oven to 350, spray 9×9 pan. Spread into pan. Bake 20 – 25 minutes. ***I always double the recipe. It’s brownies. And after I eat about 1/4 of the raw batter….. If anyone has other variations, I’d love more ideas ! …so thats why I hear harps when I eat them…..
Brownies are my absolute favorite:). Love the variations! I know ! They’re not cake, not cookies…..the perfect way to pig out on chocolate ! Ok, I really need to confess this. There is a pan of them in my kitchen right now. OK, I feel much better; but another brownie couldn’t hurt, right? The raw batter is the best! are they allowed to “run out” ? Inconcievable ! I guess I’m a teen boy, because what you see in that photo is exactly what I do with my brownies too… sometimes, if any are left after the first ten minutes out of the oven. 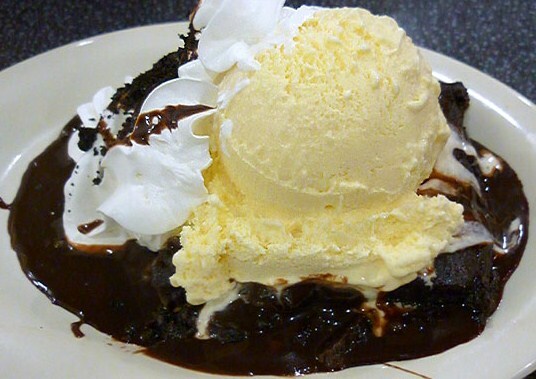 Nothing like a warm gooey brownie! Oh yes, RIGHT out of the oven ! I have to say, he makes some great stuff…..
Heavenly chocolate – those look so delish – I made a batch of brownies yesterday and have been circling them since. ..the only way they last overnight in this house is if I hide them ! It is hard to hide them on myself…..
exactly, its one of those guilty pleasures things ! & try my fav. variation, #16 !!! Oh I am soooooo hungry for brownies right now! i’m aaalways hungry for brownies ! Yes, and accept NO substitutes!